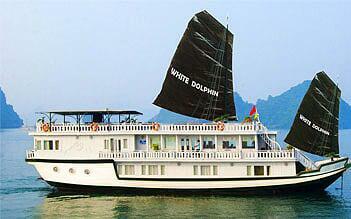 With the luxurious design, White Dolphin will give visitors an unforgettable trip when exploring the World Heritage Site Halong Bay. 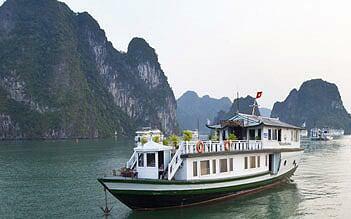 The ship features ten cabins with premium furniture made from natural wood which combines the tradition and modern. All rooms have large windows overlooking the sea where you can enjoy panoramic views of Halong Bay. The warm dining room will give guests an amazing experience with Vietnamese and international dishes. The sundeck is the ideal place for sunbathing and sightseeing while sipping a cup of coffee and cocktail.